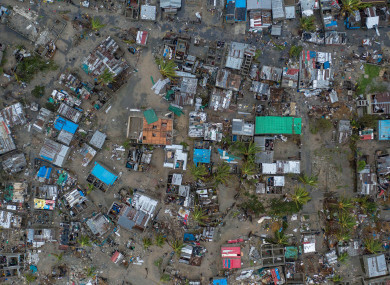 A general view shows damages caused by tropical cyclone "Idai" in Mozambique. THE DEATH TOLL from a cyclone that smashed into Mozambique and Zimbabwe has risen to more than 300, as rescuers raced against the clock to help survivors and the UN led the charge to provide aid. The UN, meanwhile, said that one of the worst storms to hit southern Africa in decades had also unleashed a humanitarian crisis in Malawi. The storm is affecting nearly a million people and forcing more than 80,000 from their homes. We just save what we can save and the others will perish. In Nhamatanda, some 60 kilometres northwest of Beira, 27-year-old Jose Batio and his wife and children survived by climbing onto a roof. But a lot of their neighbours “were swept by the water”, he said. The city of Beira, Mozambique’s second largest city and a major port, was immediately cut off after the storm. According to the Red Cross, the cyclone damaged or destroyed 90% of the city of half a million people. President Nyusi, speaking today after attending a cabinet meeting in the ravaged city, said the confirmed death toll stood at 202 and nearly 350,000 were “at risk”. “We are in an extremely difficult situation,” Nyusi said, warning of high tides and waves of around eight metres in the coming days. Yesterday, Nyusi had said he feared more than 1,000 had died and more than 100,000 people were in danger. Families started burying their dead in damp graves yesterday, as injured survivors filled up the hospitals, an AFP correspondent said. Email “Death toll from Mozambique tropical cyclone rises over 300 with tens of thousands at risk”. Feedback on “Death toll from Mozambique tropical cyclone rises over 300 with tens of thousands at risk”.